As the Elimination Diet continues, I'm steadily working my way through a small mountain of fresh produce. If you put a tape recorder next to my desk, all the munching and crunching might cause you to conclude that there was a rodent gnawing through the chair leg. The counter is piled with apples and mangoes and avocados and pears. The refrigerator is stuffed with broccoli and cauliflower and lettuces. Prior to beginning this cleanse, I thought that I might long for stewed or braised things to eat during the cold, rainy weather, but this fresh, crunchy produce turns out to be a perfect foil for grey skies. Since this program more or less forces you to eat mostly fruits and vegetables, I've realized that there has been a major discrepancy between how much fresh produce I thought I was eating regularly and how much I really was eating. I want less prepared food in my diet and more of the straight stuff, and it turns out that I kind of have to force myself to do it. Maybe I can make this a habit? Happily, I've rediscovered cabbage - green cabbage, red cabbage, Napa cabbage - and have been eating it all different ways. I loved this salad so much that I wanted to share it - bright and crisp, it makes a great lunch, or a wonderful side salad to serve with steamed fish or warm lentils. 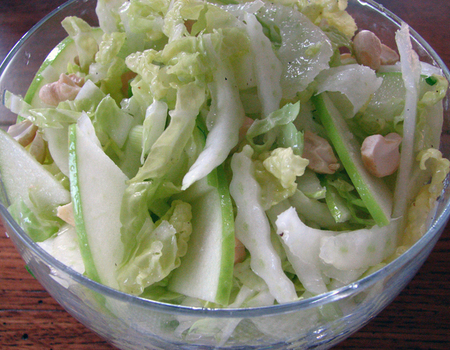 In a deep salad bowl, toss together the cabbage, fennel, apple slices, green onions and cashews. In a small container, whisk together the remaining ingredients until thick and creamy; season to taste. Add more lemon juice, if desired. Drizzle over the salad ingredients and toss. Eat immediately. This is a Flickr badge showing items in a set called 365 : a year in photos. Make your own badge here.